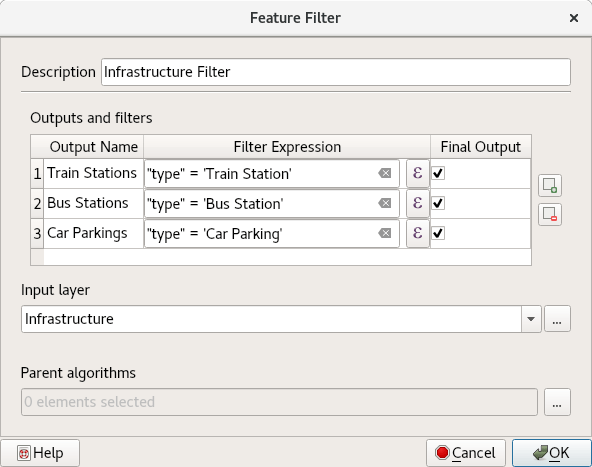 This article describes a new algorithm for the processing modeler called feature filter algorithm. 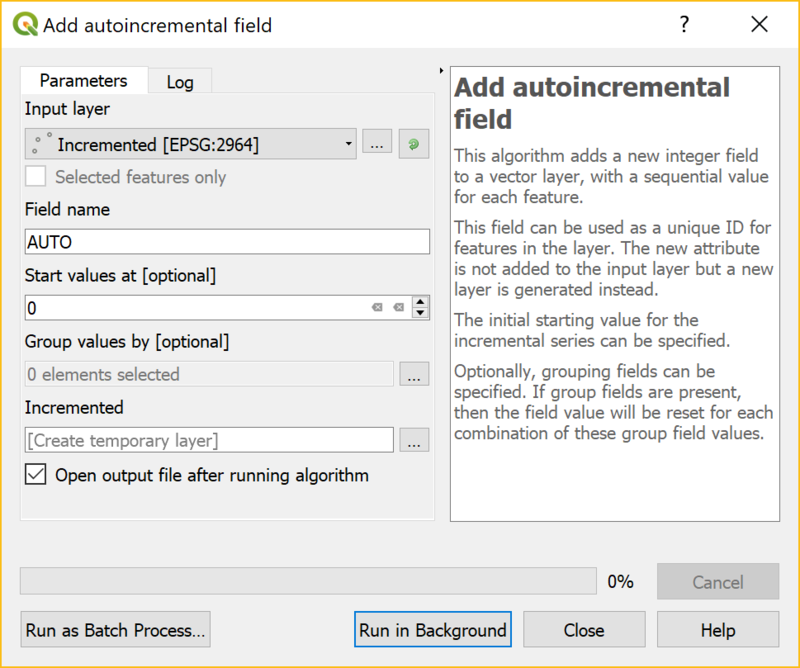 If you are already familiar with ETL concepts and the graphical modeler, you can directly jump to the section the feature filter algorithm. 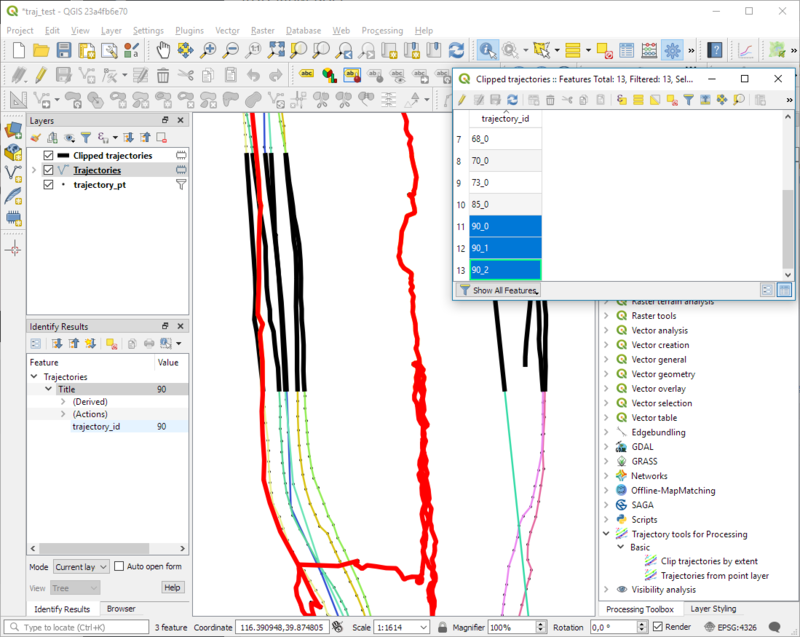 When building workflows for simple or complex geodata infrastructures, one of the most common tasks one encounters is to extract some of the features and copy them to another destination. Sometimes they need to be modified and a few attributes calculated or deleted, maybe even the geometry needs to be adjusted or in some fancy situations one even wants to generate a couple of objects from one input object. This process is often called ETL (Extract, Transform, Load) and it is something that is worth mastering as a GIS expert. Let’s imagine a situation where we sent a field worker out to collect information about public infrastructure, equipped with a brand-new tablet and the latest and greatest version of QField. To make his task super easy, we prepare one single layer for him with an attribute type which can be set to Bus Station, Car Parking or Train Station. Now back in the office we want to integrate this back into our spatially enabled database which has been designed with 3 target tables. 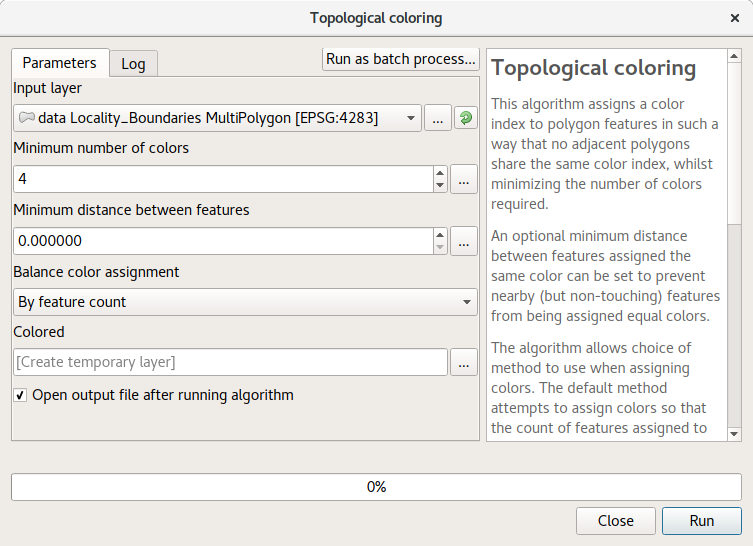 Easy enough to go to QGIS and select those features by type one after the other and use a bit of copy-paste. And maybe fiddling a bit with the attributes. But hey, after all we are a bit lazy and on the one hand like to have an ice cream later on that afternoon and on the other hand like to avoid errors. Those who are lucky enough to know SQL and have full access to the database are well enough equipped to do the job. 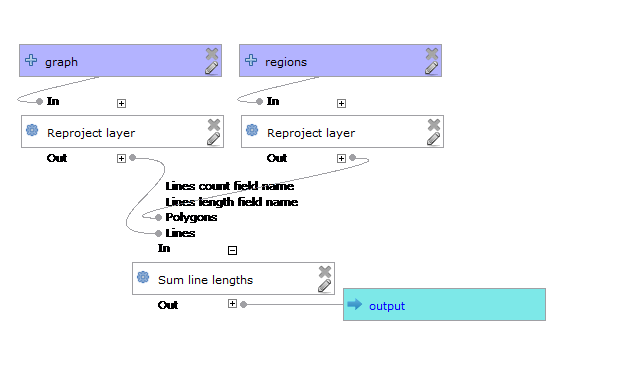 For those who just want to quickly do this job visually within QGIS, there is a tool called modeler in the processing plugin. With the help of this tool it is straightforward for everyone to automate processes. 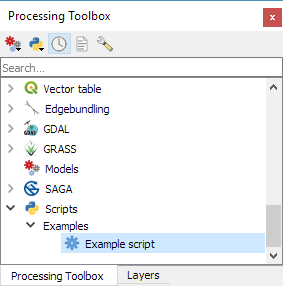 To get started with the modeler, simply enable the processing plugin and click on Processing > Graphical Modeler. 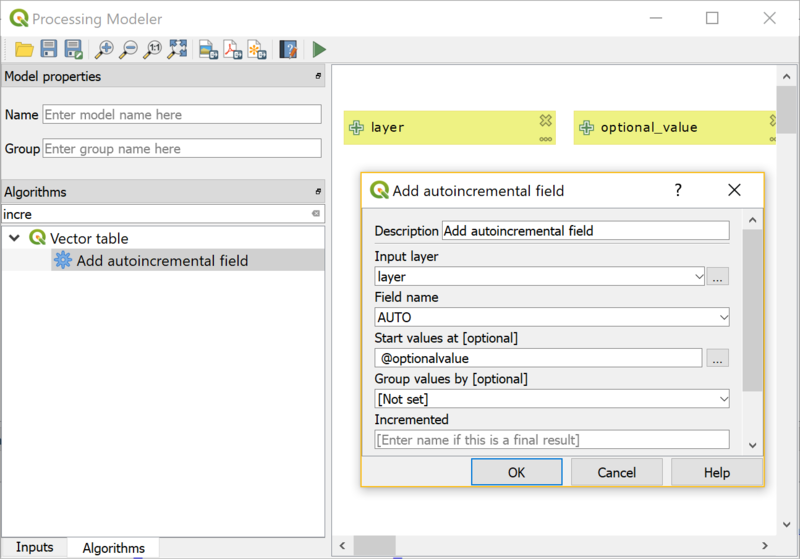 Within the modeler, there are Inputs and Algorithms available. Inputs are there to define variables, algorithms on the other hand transform those variables. In its most simple form, there is one vector feature source (a layer) as input and one algorithm, for example a fixed distance buffer which in turn has one output layer with all buffered features. Such a model can be saved and reused. To run a model directly from the modeler, click the play button on top. Once saved, it appears in the processing toolbox. Every time a model is run, the input layer can be handed to the model. Or it can even run in batch mode on a list of layers or files. With this in place, the job of doing the buffer can now be run on 200 input layers without any manual interaction. Simple as that. 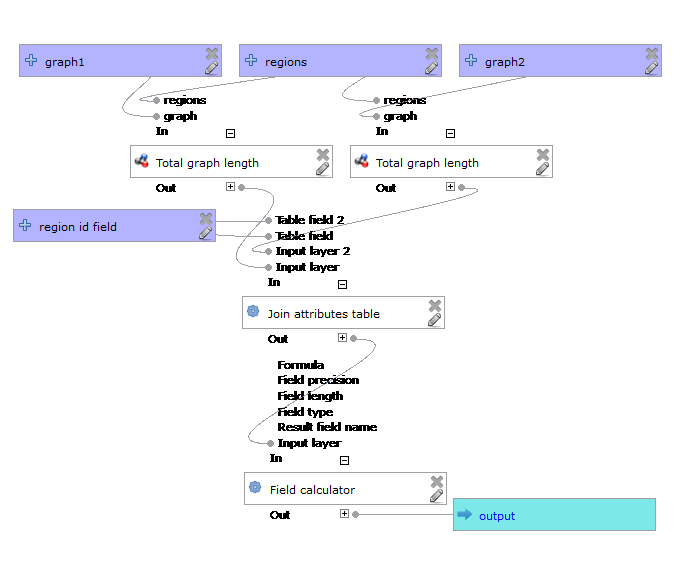 Pro tip: processing models do not have to be complex. They can also be used to preconfigure single algorithms so when an algorithm is run, the parameters which you never change are predefined already. For example you can add a Simplify geometries to 1 meter algorithm which only takes a layer as parameter and has the 1 meter tolerance built-in. Now back to the job of splitting the infrastructure layer into 3 different layers. 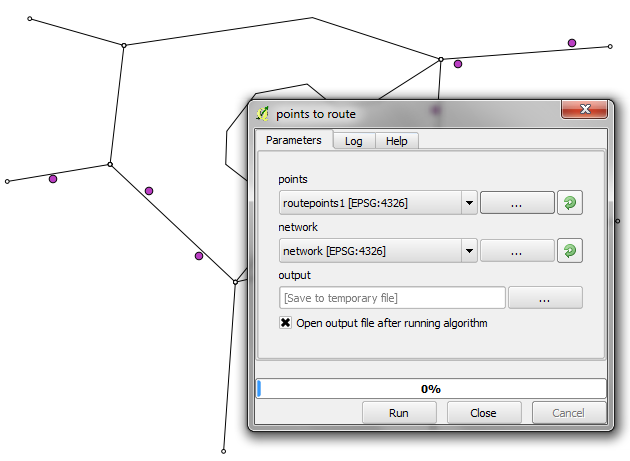 To do this job visually and easily within QGIS, there is now a new algorithm available in QGIS 3.2. It is called Feature Filter and available in the processing modeler. 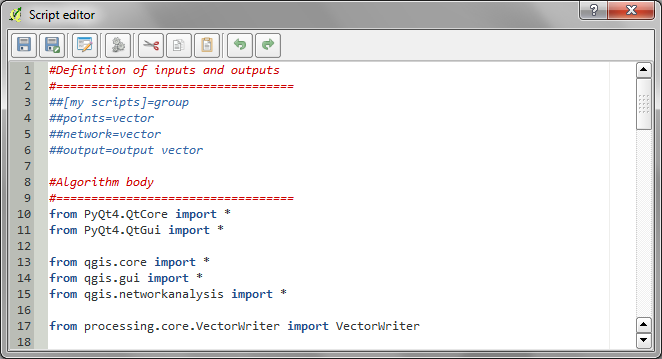 To make use of it, we open the processing modeler and first add a new Vector Features input and name it Infrastructure. Since we know in this project we will always deal with points, we can make already specify that in this first dialog. 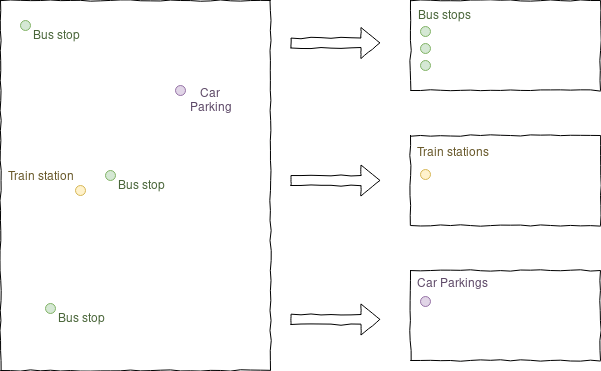 The Infrastructure layer is set as input, and we define three outputs for Train Stations, Bus Stations and Car Parking. All layers will be final outputs on which no further transformations will be applied within this model and they will be directly written to a new layer. Now it’s time to run our new model and check that it does what it promised. 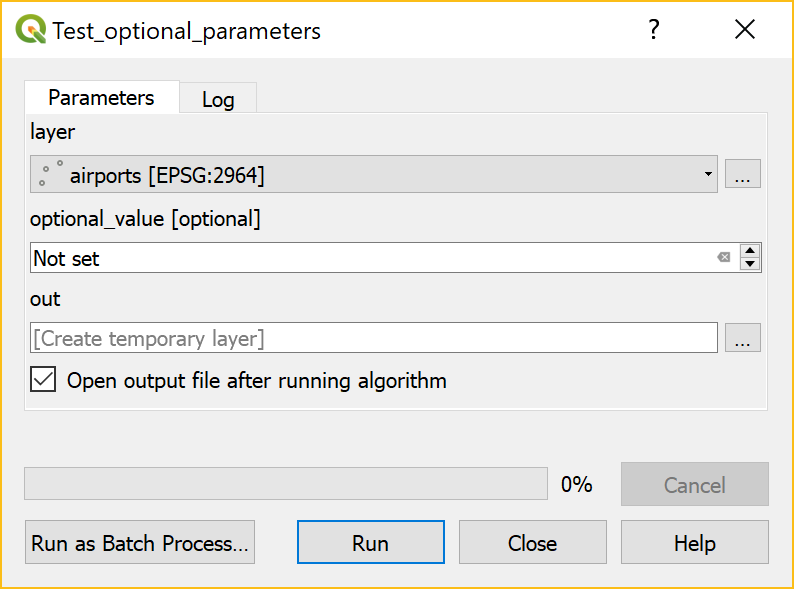 We can also uncheck the final output checkbox and send filtered features to further processing algorithms. 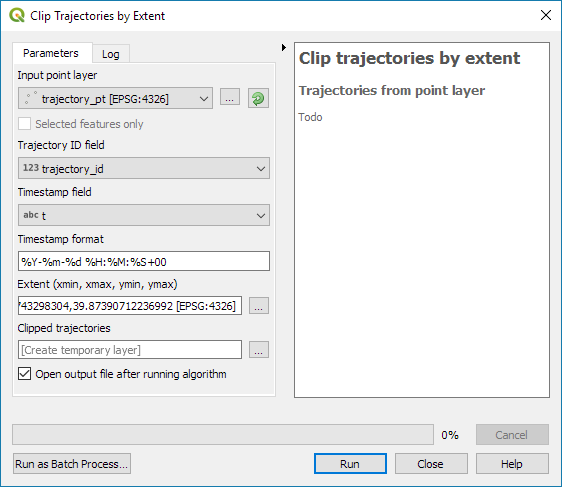 For example sending them through a buffer based on an attribute size (although as a QGIS professional you know you should rather be using styles than modifying the geometry in most situations in such cases). 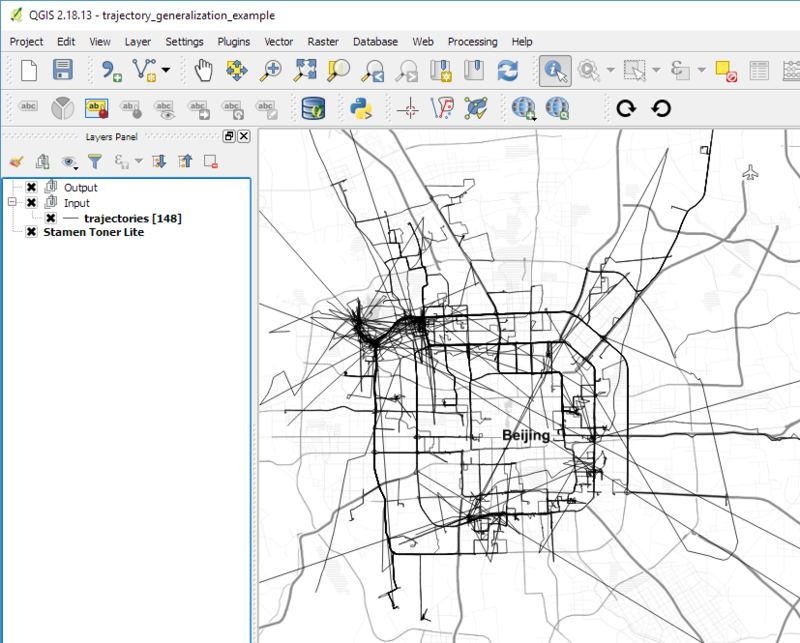 With this new algorithm built directly inside the core of QGIS, the processing framework is now able to transform and refine features of a dataset with the same precision as an open heart surgery. Of course you can get more creative in the filter criteria. The data from this walkthrough is available for download as [download id=”3917″]. 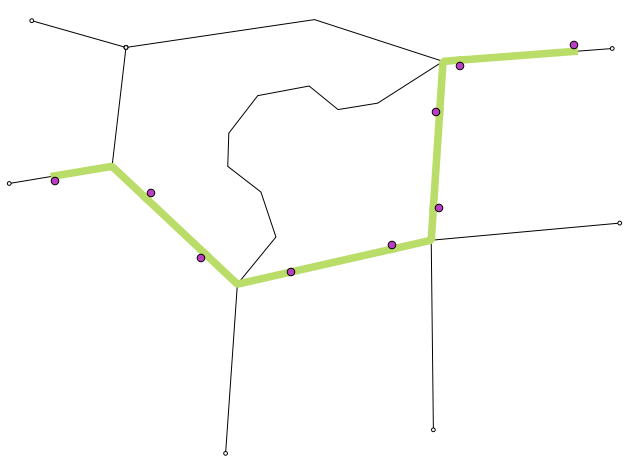 If you would like to test this new feature but do not yet have a concrete use-case in mind, here is a task for you: get an openstreetmap extract, import it using ogr2ogr and split the lines into different layers roads, rivers and railways, the polygons into lakes, forests and cities, the points according to your own liking. If there is big enough interest for this, we might write another blog post on this topic. 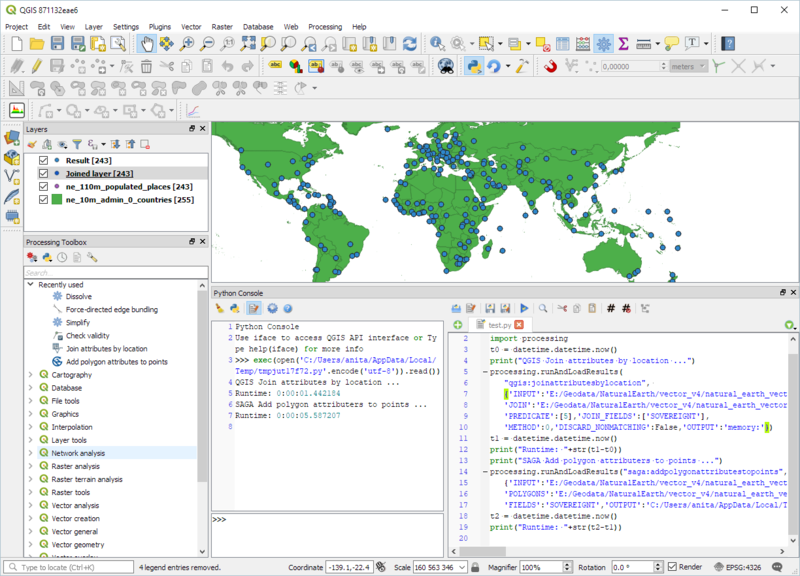 We would like to thank the QGIS user group Switzerland for making this project possible through funding. Getting a pixel count and area size of unique values for a given raster layer hasn’t been straightforward in QGIS. The user could either go through third-party solutions via processing with some limitations, or create a (slow) python script. That is, until now. Say hello to the newly-committed processing algorithm, the “raster layer unique values report”. 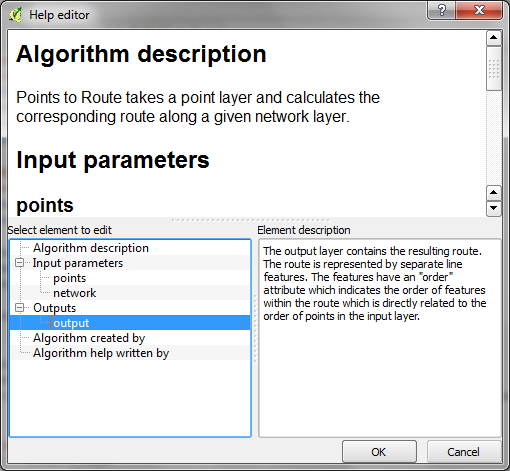 The QGIS algorithm will take a raster layer as input and output an HTML formatted report listing the pixel count and area size – in the raster layer’s unit - for all unique values. 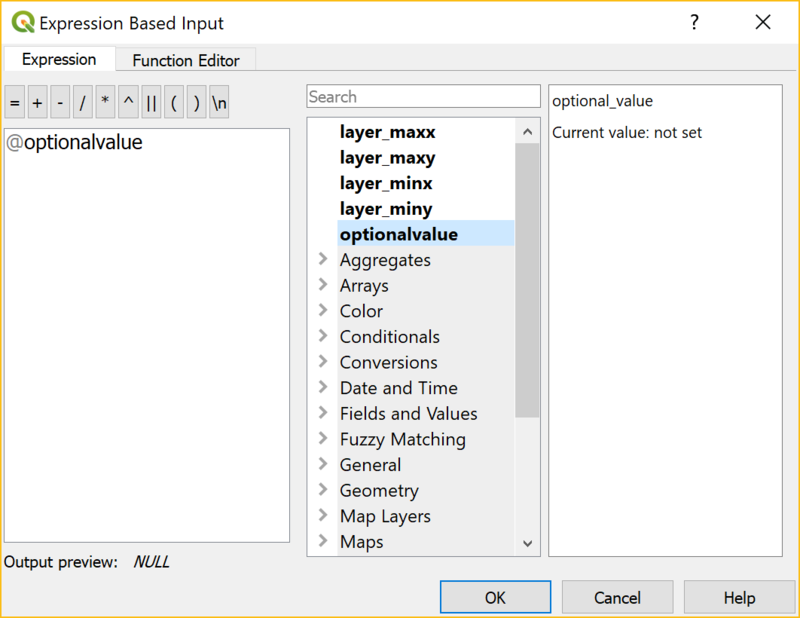 Thanks to QGIS core developer Nyall Dawson’s fantastic work on the processing platform in upcoming QGIS 3.0, the algorithm is written in C++ and therefore much faster - over a tenfold improvement - to an equivalent python script. If you follow my blog, you’ve most certainly seen the post How to create illuminated contours, Tanaka-style from earlier this year. As Victor Olaya noted correctly in the comments, the workflow to create this effect lends itself perfectly to being automated with a Processing model. You can find the finished model on Github. Happy QGISing! The final Compare total graph length model combines two instances of “Total graph length” whose results are then joined to eventually calculate the length difference (lenDIFF). As usual, you can find the models on Github. If you have any questions, don’t hesitate to ask in the comments and if you find any issues please report them on Github. Over the last years, research on OpenStreetMap data quality has become increasingly popular. 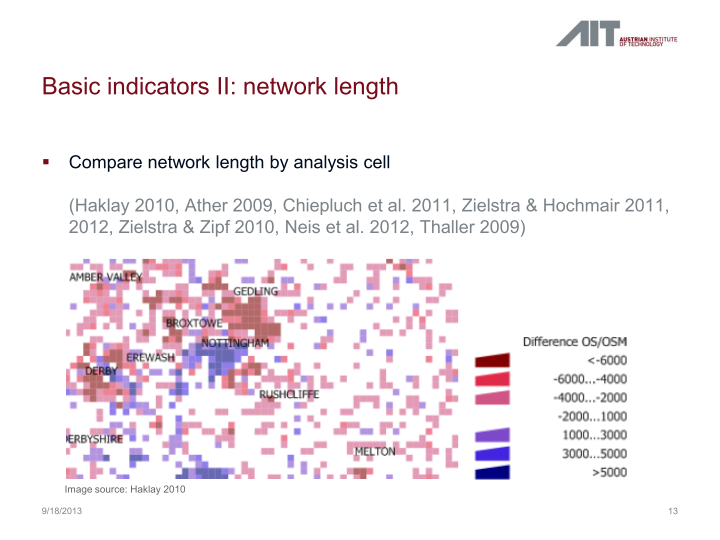 At this year’s FOSS4G, I had the honor to present some work we did at the AIT to assess OSM quality in Vienna, Austria. 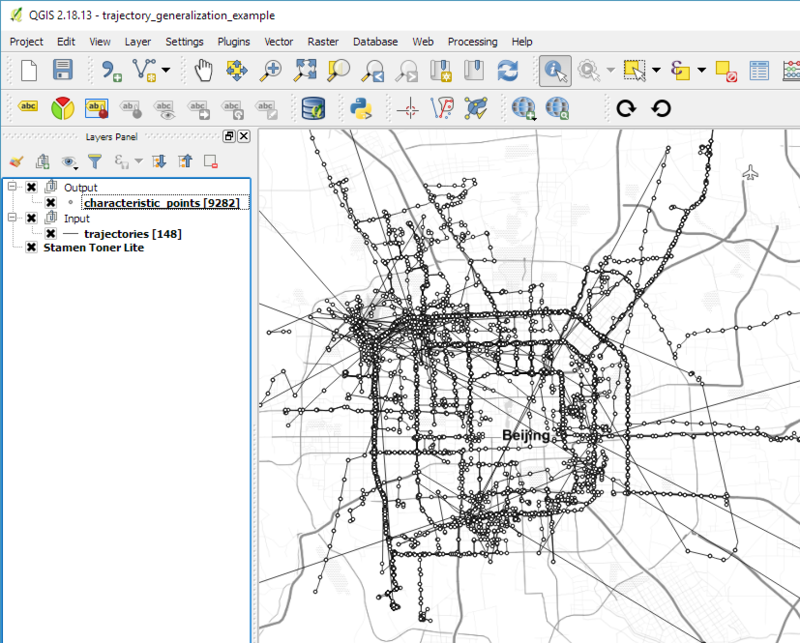 In the meantime, our paper “Towards an Open Source Analysis Toolbox for Street Network Comparison” has been published for early access. Thanks to the conference organizers who made this possible! 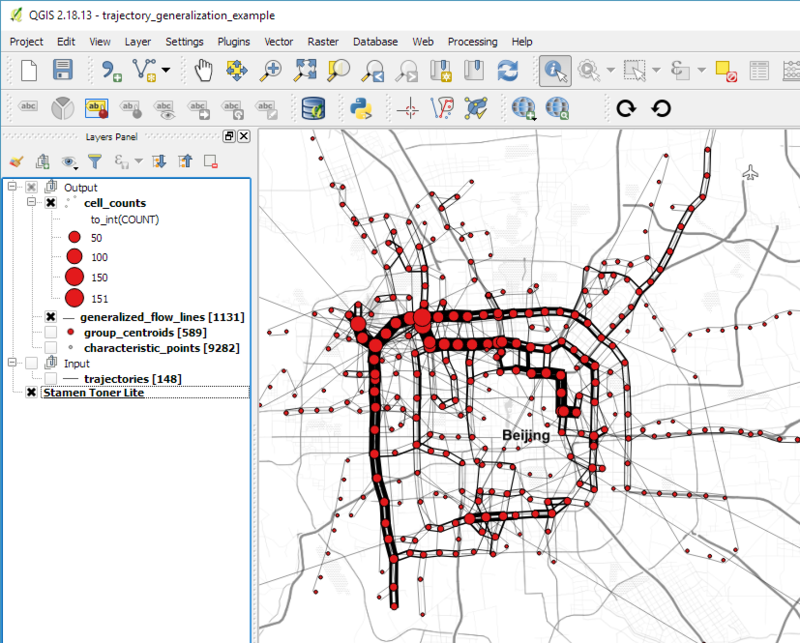 I’ve implemented comparison tools found in related OSM literature as well as new tools for oneway street and turn restriction comparison using Sextante scripts and models for QGIS 1.8. All code is available on Github to enable collaboration. If you are interested in OSM data quality research, I’d like to invite you to give the tools a try. 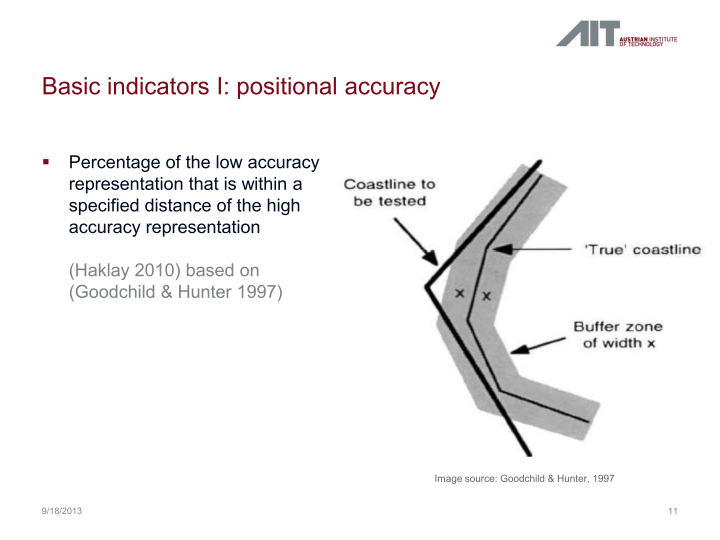 The basic idea is to evaluate the positional accuracy of a street graph by comparing it with a reference graph. To do that, we check how much of the graph lies within a certain tolerance (buffer) of the reference graph. First, all layers are reprojected into a common CRS. This will have to be adjusted if the tool is used in other geographic regions. Then the reference graph is buffered and – since I found that dissolving buffers directly in the buffer tool can become very slow with big datasets – the faster difference tool is used to dissolve the buffers before we calculate the graph length inside the buffer (inbufLEN) as well as the total graph length in the analysis region (totalLEN). Finally, the two results are joined based on the region id field and the percentage of graph length within the buffered reference graph (inbufPERC) is calculated. A high percentage shows that both graphs agree very well geometrically. 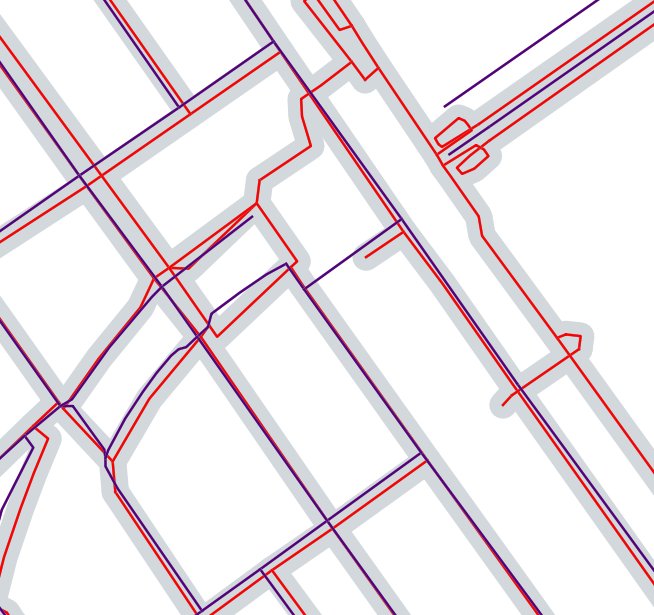 The following image shows the tool applied to a sample of OpenStreetMap (red) and official data published by the city of Vienna (purple) at Wien Handelskai. 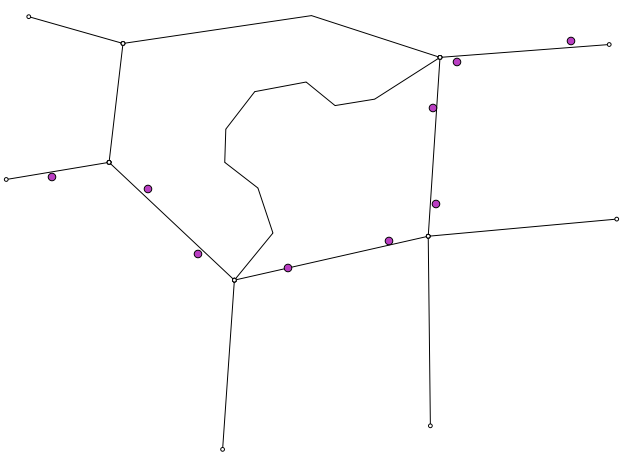 OSM was used as a reference graph and the buffer size was set to 10 meters. In general, both graphs agree quite well. The percentage of the official graph within 10 meters of the OSM graph is 93% in the 20th district. In the above image, we can see that links available in OSM are not contained in the official graph (mostly pedestrian/bike links) and there seem to be some connectivity issues as well in the upper right corner of the image. 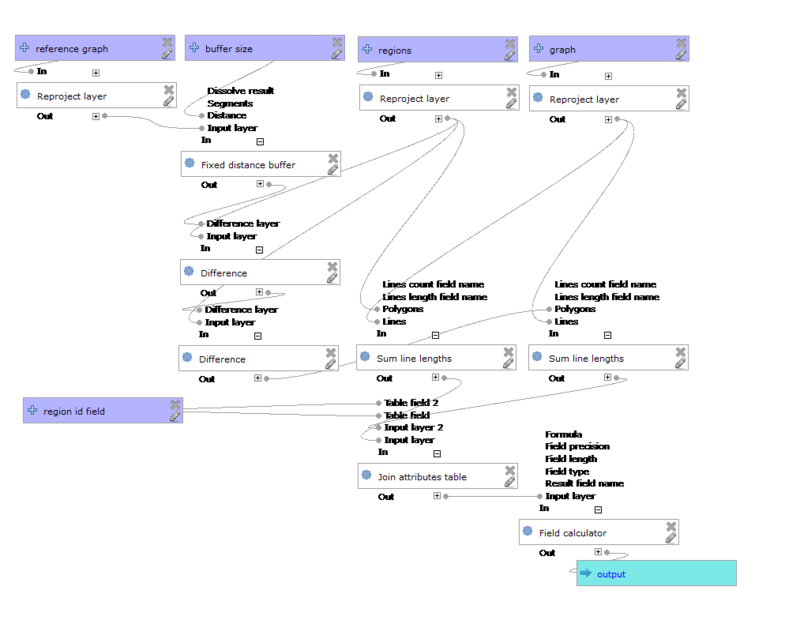 In my opinion, Processing models are a great solution to document geoprocessing work flows and share them with others. If you want to collaborate on building more models for OSM-related analysis, just leave a comment bellow. 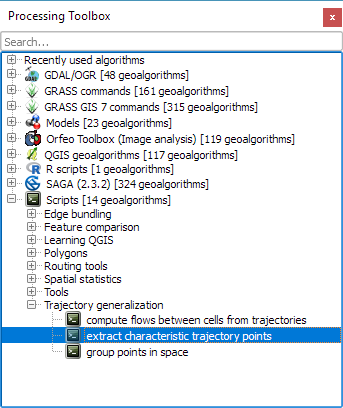 Processing has received a series of updates since the release of QGIS 2.0. 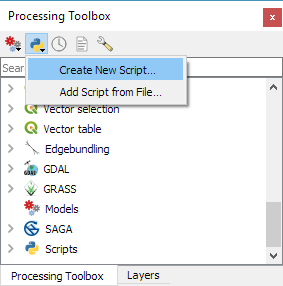 (I’m currently running 2.0-20131120) One great addition I want to highlight today is the improved script editor and the help file editor. 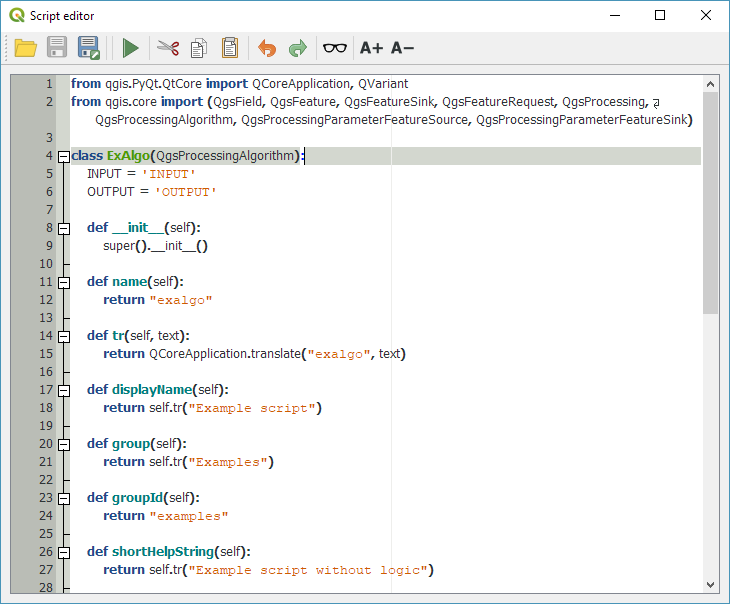 The improved script editor features a toolbar with commonly used tools such as undo and redo, cut, copy and paste, save and save as …, as well as very useful run algorithm and edit script help buttons. It also shows the script line numbers which makes it easier to work with while debugging code. The model editor has a similar toolbar now which allows to export the model representation as an image, run the model or edit the model help. When you press the edit script help button, you get access to the new help editor. It’s easy to use: On the top, it displays the current content of the help file. On the bottom-left, it lists the different sections of the help file which can be filled with information. 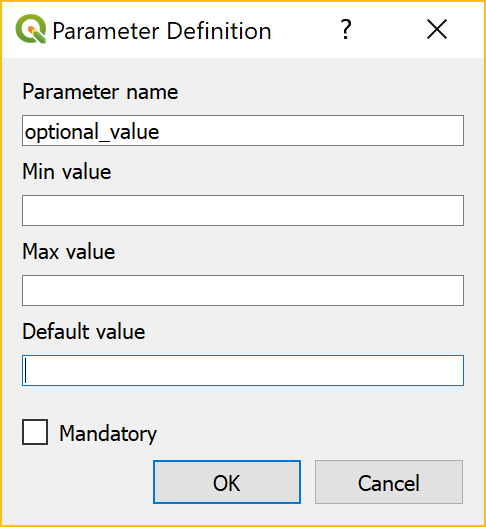 In the input parameters and outputs section, the help editor automatically lists the all parameters specified in the script code. Finally, in the bottom-right, you can enter the description. The resulting help file is saved in the same location as the original script under the name <scriptname>.py.help. 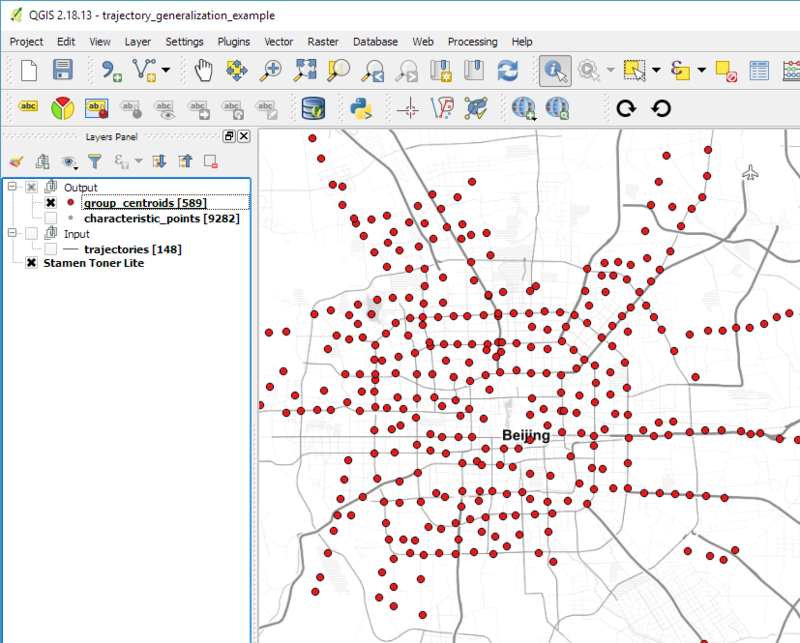 Did you know that there is a network analysis library in QGIS core? It’s well hidden so far, but at least it’s documented in the PyQGIS Cookbook. 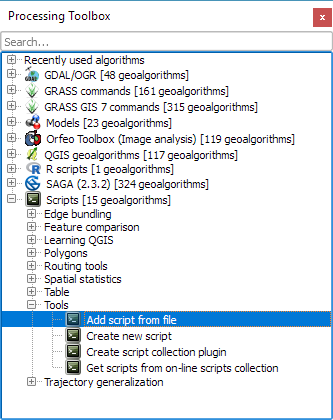 The code samples from the cookbook can be used in the QGIS Python console and you can play around to get a grip of what the different steps are doing. As a first exercise, I’ve decided to write a Processing script which will use the network analysis library to create a network-based route layer from a point layer input. You can find the result on Github. The input points are considered to be ordered. The tool always routes between consecutive points. The network analysis library is a really great new feature and I hope we will see a lot of tools built on top of it.